Customizable Scenery Configurator for flight simulation developers. PRO version also for commercial use! You are buying a license for ONE commercial project / scenery / Add-On. If you want to include the Software in additional projects you should consider buying more licenses. Version 2.0.0.4 released on 21/05/17! This program allows flight simulation developers to create a customizable scenery configurator based on their needs. The basic concept is a program that activates and deactivates files by changing the file extension. This makes it possible for the developer to provide different levels of detail and complexity which can be chosen by the end-user. This concept makes it even possible to change the appearance of the scenery based on the season the user has selected. Season switching in the common flight simulators such as Microsoft’s Flight Simulator X or Lockheed Martin’s Prepar3D is a complex topic since the BGL file format does not allow automatic season switching by default. This tool makes it possible for the user to switch seasons and much more, it is all up to your configuration! Automatic update of the Scenery Configurator. 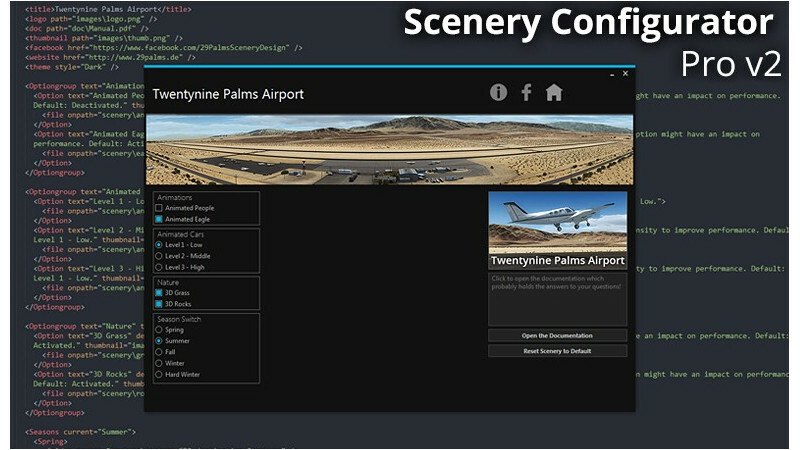 29Palms - Scenery Configurator PRO - Documentation. This scenery configurator really makes a developer's life easier! It is nice looking and easy to configure. Definitely a must-have for any scenery developer!